It was a beautiful day and I had to get some keepsake jars I made last week done. The bottoms were still a little soft so I put outside on a cafe table I have in the shade. They were all perfect to open and trim by noon. One little keepsake got a little bit of sun. It is sunburnt. I will not be adding anything to this one! I may get out the shellac and water etch it. Some of the keepsakes will get little bits of clay added, some dipped in white porcelain milk. All interiors will get white slip except the ones slipped white on the outside. Some will have something special in the inside. Most of these are small. They fit in your hand. I didn't measure a lid for this jar. I made two---eyeballing. Turns out they both fit just right. I guess after a while your hand/eye just knows. 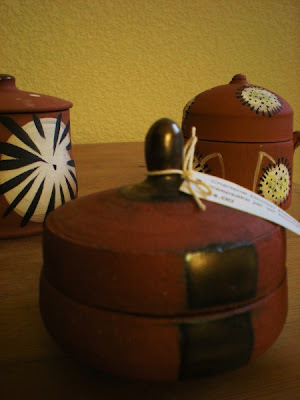 I decided to use the tip of my wood trim tool to press into the soft clay in one of the lids. Doing this got me thinking about using this in a sculpture. Then I did some more thinking (ouch) and decided that I need to make up some test tiles. Test tubes, actually. Charlene - I love these keepsake jars. When I first saw them, it made me want to get my hands in clay! Love the red clay with your slip design choices - Iast photo! Judy---These were made with 1 to 1 1/2 pounds of clay. Very satisfying and playful to make. Especially if it is autumn and one's wheel is outside!